A look at what’s new from Genesys, Dialpad, Aerohive, Verizon, and Digium. The countdown to Enterprise Connect is on! With just over three weeks to go before the big event, take a few minutes to catch up on some of the latest developments in the enterprise communications industry. This week, we're looking at product announcements from Genesys, Dialpad, Aerohive, Verizon, and Digium, covering everything from voice and cloud, to access points, WLAN, and IP phones. Contact center provider Genesys this week announced the expansion of voice options for its PureCloud platform. First, the company revealed that PureCloud Voice is now available in the U.K., and will be available in the Netherlands, France, and Ireland later this quarter. By the end of 2018, Genesys said it plans to extend the offer to an additional 15 markets in Europe and Asia Pacific. Seventy percent of Genesys's North American customers are using PureCloud Voice, Olivier Jouve, executive vice president at Genesys PureCloud, told me in a briefing. Many have been requesting service availability outside of the U.S., with about half of its overall business is outside of North America, he said. Second, Genesys is adding a bring-your-own-carrier (BYOC) option, that will allow customers to have their carriers of choice bring their calls directly to PureCloud platform, appliance free, Jouve said. Not only does this option offer customers deployment flexibility, it serves the company's partner ecosystem, as well, he added. "Genesys has a history of selling through partners, many of them carriers, and we don't want to create an environment where the partners we've worked with for many years feel disadvantaged." UCaaS provider Dialpad continues beefing up to gain traction among the smallest of the small, midsized, and the largest of the large businesses. For ultra-small businesses, the company has extended the geographic reach of and authentication options for its two-month-old Dialpad Free cloud phone service. Dialpad Free, for businesses with five or fewer employees, is now available across the U.S. The nationwide availability follows on a short trial period in which Dialpad offered the service in the Bay Area exclusively for companies using Google's G Suite, as reported by No Jitter at the time. New subscribers can now also use Microsoft Office 365 or Dialpad's Open Signup to authenticate to the new phone service, said Sara Jew-Lim, a product manager at Dialpad, in a briefing. Separately, Dialpad has of late been working to build up a channel presence to better target midmarket and enterprise business. Toward that end, it recently hired a VP of channel sales to create and lead a dedicated channel sales team, and this week the company announced that it has signed a partnership deal with SHI, a leading IT solutions provider, to offer Dialpad's UCaaS solutions to midmarket and enterprise businesses in North America. And in other news, Dialpad is now offering an HD calling option for its UberConference meeting service. The update delivers HD-quality audio for UberConference users on Android smartphones or tablets – as long as they have stable Wi-Fi or LTE/3G/4G connections and the latest version of the UberConference app for Android, Jew-Lim said. Aerohive last week released "a new way to Wi-Fi" with Atom, a pluggable enterprise-grade access point (AP), following on its announcement of its first 802.11ax APs (see related post, "802.11ax Race Is On"). When plugged into a power outlet, Atom automatically connects to the network, it requires minimal to no configuration, Aerohive said. With Atom, shown below, Aerohive aims to change the status quo of APs, which are traditionally ceiling-mounted, by making them easy to deploy and move around an office as necessary, for example. Organizations that want to keep the AP in a designated place can use an optional security bracket for screwing Atom into the socket so it can't be picked up and carried off. 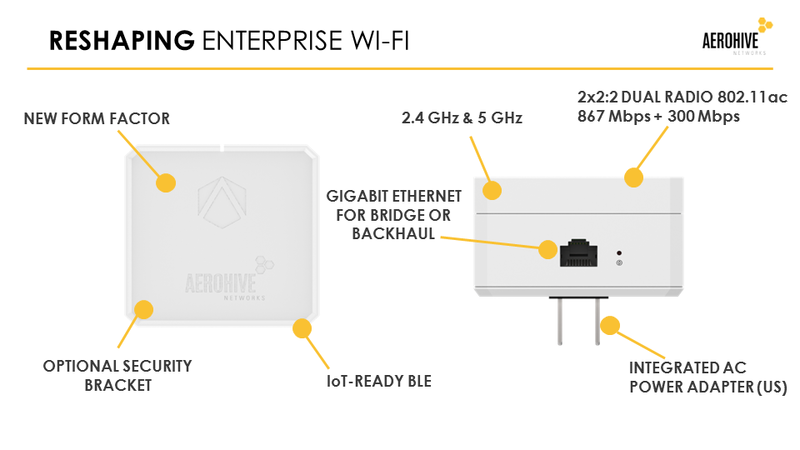 Besides tackling Wi-Fi dead zones, Atom is useful for things like augmenting overloaded ceiling-mounted APs, extending corporate connectivity to places like lobbies and waiting rooms, and even bridging Internet of Things devices and sensors to the network, Aerohive said. Aerohive Atom AP30 is initially available for Type A and B power plugs, with availability for a wider set of international power plug compatibility currently under development. It will be available for purchase at $599 in the second quarter in the U.S., Canada, Japan, and Mexico. Verizon Enterprise Solutions has launched a managed software-defined wireless LAN (SD-WLAN) service to provide visibility into enterprise wireless network operations and Bluetooth-enabled devices connected to the network. Via the SD-WLAN service, net administrators can tailor network access and security configurations to individual users, Verizon said. Verizon is leveraging artificial intelligence and machine learning technology from Mist Systems (covered in the recent No Jitter Roll) to enable automatic monitoring and management for the SD-WLAN solution. Specifically, SD-WLAN analyzes network and user data to identify issues like unauthorized user access attempts and "network choke points" with the goal of helping enterprises determine whether they need to scale network resources up or down. "Our enterprise users are increasingly using wireless LANs, yet innovation around management of WLANs has not kept pace," said Vickie Lonker, VP of product management and development at Verizon, in a prepared statement. "SD WLAN ... is the next step in our overall SDN strategy." This week Digium, provider of Asterisk software and telephony hardware, announced the availability of a line of "budget-friendly" desk phones for Asterisk-based systems. Pricing for the new A-Series IP phones start at $59, and each model features a color display, HD voice, and multiline functionality. "Additionally, purchases of the A-Series phones help fund the Asterisk open source project and support the greater Asterisk community," said Charlie Wilson, director of developer products at Digium, in a prepared statement. The phones, which will be available in March, will complement Digium's D-Series business phones, Digium said. Get up to date on everything going on in enterprise communications at Enterprise Connect 2018, March 12 to 15, in Orlando, Fla. Register now using the code NOJITTER to save an additional $200 off the Early Bird Pricing or get a free Expo Plus pass. No Jitter Editor Beth Schultz also contributed to the writing of this piece.